ANNETTE* IS A foster carer in Connacht. She and her husband care for children long-term. Those children are just a tiny fraction of the over 6,000 children who will spend Christmas in some form of State care. Caring for children in that situation can be a very complex undertaking at the best of times, but Christmas time can put particular strain on the children and families involved. Annette told TheJournal.ie that, at “the end of the day”, the children in their care are not their children by birth. The children in her care are there on a long-term basis, but that doesn’t mean they have a negative or confrontational relationship with the birth family. 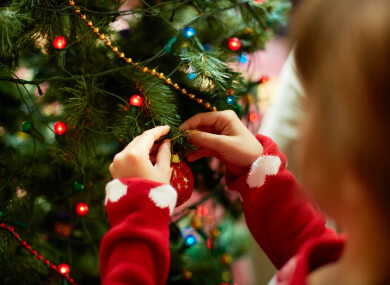 So what is like for children at Christmas time in care? Annette said that the emotional time of year can really drive it home to the older children that their situation may not be the same as their peers but, with younger children, it can be easier to put them at ease and help them to enjoy the period. “At all stages, what you need to do is help the child. Help them cope with the situation that they’re in,” she said. Every situation is unique – as is the whole dynamic. Some children may not be allowed access to their birth parents at Christmas. Or access may have to be supervised. If access is supervised, that can generate resentment and anger. I think preparation and talking to the child is so important. Their feelings are very real. They need to be validated. You need to allow them to talk, and to come to some sort of solution. It builds resilience in them. There’s no point avoiding the conversation. She said that another key part is giving the children a little bit of ownership when making decisions over the Christmas, and involving the birth family where possible. Annette said: “For us, we plan Christmas with the birth family. You have to be very inclusive. We invite granny, grandad and mam here before Christmas and have a mini-Christmas Day with them. Then we’d spend the actual day with my own family. She said that books can often be a way of communicating to the children how best to deal with the situation. “I use this beautiful book – it’s called The Invisible String by Patrice Karst,” she said. “It talks about reassuring children of the power of love. It helps them deal with the anxiety of being separated. You want to validate what they’ve lost, but also give them the tools to cope with it. Christmas time – it’s such an emotional time. It can emphasise the difference. Annette said that she and the children attend a Christmas party organised by the Irish Foster Care Association every year, and that the children really benefit from interacting with others in the same position, and that it creates a sense of community. The IFCA operates a support helpline for foster carers that is confidential, responsive and personal. It provides practical information and advice regarding any aspect of fostering as well as a supportive listening ear. Annette said that it’s really important to have supports in place for foster carers, as each child is so unique as to make handling Christmas time a challenge in every case. Geraldine* is a foster carer based in Leinster. Similarly to Annette, the children in her care are with her long-term. “We’re very lucky,” she told TheJournal.ie. “I’ve seen these children grow. Some children come with a lot of baggage, and a lot of behavioural issues. That can be hard for foster carers. Some of these children want to be with you, and some don’t. Sending them to us is always a last resort. Like, Annette, Geraldine said that it’s a lot to do with how you frame it for the children in your life at Christmas time. She said: “Blood is thicker than water. Even though I have these kids from birth, they have a family, they have older siblings. In some way, they’re lucky they get so many presents. They know about their family. I’m their mammy in everyday life, and they have a tummy mummy who gave birth to them. The common consideration for foster carers at this time of year are the families of those in their care, and Geraldine said that while that’s not the case for her, it could very well be for others in her position. She said that being honest and conveying clearly to the children what’s going on is essential, as it makes them relax, their family relax and the foster carer themselves relax. Geraldine said: “In our set up, for some foster carers it can be a very anxious time for fostering families. Even for foster children, they mightn’t want to be in your house – but you need to treat them as you would treat your own children. Give them what you’d give your own. Include them in any activities. They are part of your family, even if it’s only for a small period. The names of the foster carers have been changed so that the children remain anonymous. Email “'They've two Christmasses. One with us and another with their birth family'”. Feedback on “'They've two Christmasses. One with us and another with their birth family'”.